It is said that Aci was a God of the Greek mythology – a shepherd with whom Galatea, a nymph, fell in love: Polyphemus, who loved Galatea, killed Aci by crushing him with a rock, and from its blood the river Akis was originated. Nowadays the river has disappeared, but “Aci” is still a word used to gather a few pretty and picturesque towns on the northern shore of Catania – Acireale, Aci Castello, Aci Trezza and Aci Catena – you can enjoy staying in one of our villas in the area. Located on a lava-stone plateau overlooking the sea, Acireale is a peaceful ancient town with a typical medieval urban structure and a gorgeous city centre studded with fascinating baroque buildings, such as the Cathedral, the town hall and the Saint Peter’s basilica, all set in the elegant and wide Piazza Duomo; a beautiful garden called Villa Belvedere, just a few minutes’ walk from the main square, is graced with an outstanding panorama as it overlooks the whole Ionian coastline. Acireale, once a very important mercantile hub, is nowadays best known for its thermal baths (Terme di Santa Venera) located at the southern edge of the city: the baths were realised in neo-classical style, but the healthy features of thermal springs were already well-known by the Greeks and the Romans too. The city is also particularly renowned for its traditional lively and colourful carnival, one of the most famous in Europe: a centuries-old tradition that gathers thousands and thousands of visitors every year. If you want to discover Catania’s surroundings you can check out all our estates in Eastern Sicily, or dig for some deals on our cheap villas in Sicily selection. Aci Castello, the closest to Catania among the Aci’s, is an ancient fishermen’s village located in a tiny gulf, at the foot of a cliff at the top of which an ancient Norman castle was built back in 1076. Made with lava stone, the castle can be accessed through a steep stairway and a scenic bridge, and it houses a “Civic Museum” collecting plenty of archaeological and naturalistic findings coming from Mount Etna, as well as a botanical garden; the panorama is wonderful as the cliff overlooks the village as well as the Ionian coastline. One of the little suburbs of Aci Castello is Aci Trezza, most famous for its huge dramatic “faraglioni” rocks, towering off the shores of the village, said to have been thrown in the sea by Odysseus, also called “The islands of the Cyclops”. The little hamlet is also famous for having been chosen as the setting of “I Malavoglia” (“The House by the Medlar Tree”) novel, one of the most important masterpieces of Giovanni Verga, Italian realist writer from the 19th Century. 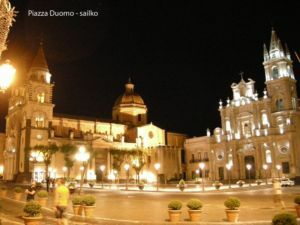 Aci Catena, 20 kilometres far from Catania, is noteworthy as well thanks to its refined baroque churches of San Giuseppe, with its elegant façade and the two clock towers, and Santa Lucia, as well as the Cathedral, sided by the lavish Palazzo Riggio.